If you’re like most people, tomatoes are probably the first thing that comes to mind when you think of a garden. 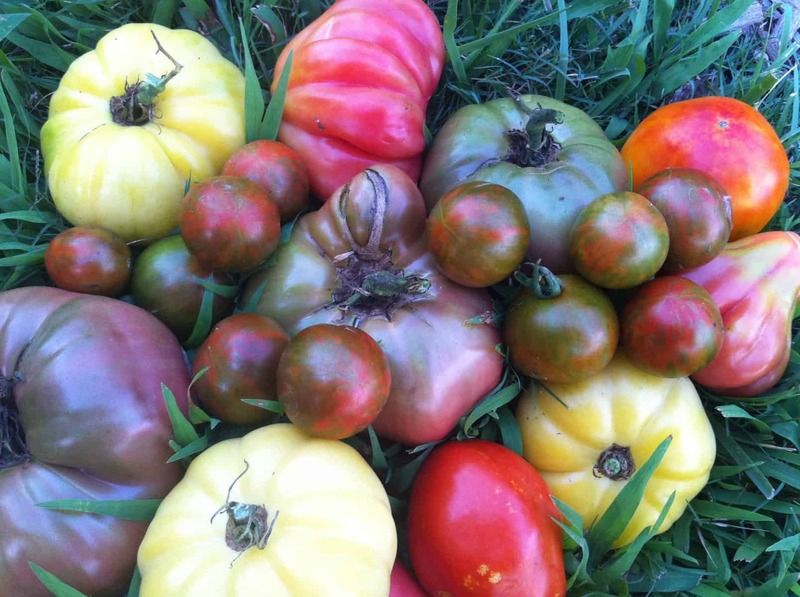 Of course, there are thousands of varieties of edible fruits, veggies, roots, tubers, herbs, edible flowers, mushrooms, and grains that might adorn your garden throughout the year, but tomatoes have somehow managed to capture the American gardener’s imagination more than any other type of produce. Perhaps it’s due to the piles of showy, delicious fruit a tomato plant can produce in a relatively short period of time. Or perhaps it’s because tomatoes are quiet, juicy geniuses who have domesticated human beings so that we’ll take care of them and spread their seeds throughout the world. These tomato growing tricks are arranged chronologically based on the order in which you do them. *Special Note: If you’re a GrowJourney member, you may have already seen this info in your Tomato GrowGuide. If you’re NOT a GrowJourney member, shame on you. You can remedy that problem by starting your free trial here. This might not seem like a “trick,” but once you master seed starting, it can save you more money than perhaps anything else you’ll ever do in your garden while also allowing you to grow any variety of produce you want, not just what your local garden center happens to carry. A packet of USDA certified organic tomato seeds will cost you about $3-4 depending on how many seeds are in the packet. Most usually have at least 25 or more seeds. That means you could grow a minimum of 25 tomato plants that could each produce a pile of tomatoes for you in a few short months. Considering that the average beefsteak tomato plant will produce 15 – 25 pounds of fruit, that single packet of seeds could give you a yield of 625 pounds of fruit. If you go to a store and buy a pound of crummy hothouse tomatoes, you’re going to pay $3/lb; if you buy a pound of certified organic heirloom tomatoes, you’re probably going to be paying closer to $6/lb. So, if you expertly use 25 seeds to grow 625 pounds of your own organic, heirloom tomatoes, you just grew $3,750 in tomatoes! Tlacalula, an heirloom stuffing tomato from Mexico. Cost of the single seed that grew this beauty? About 10 cents. And it was full of new seeds that we can grow in future years. Also, if you’re growing heirloom tomatoes (which are always open-pollinated), you can save enough seeds from your tomatoes to give a seed to every person on earth after about two growing seasons (seriously, do the math!). See why heirloom/open-pollinated seeds are the gift that keeps on giving? “Sure,” you’re thinking, “but what about the time and cost involved in growing tomatoes from seed?” We have friends who do this every year at virtually no cost using old solo cups, their own seed starting mix (seed starting mix should be lighter than regular garden soil so vermiculite or coconut coir needs to be added to regular garden soil), free sunlight and low cost tap water. 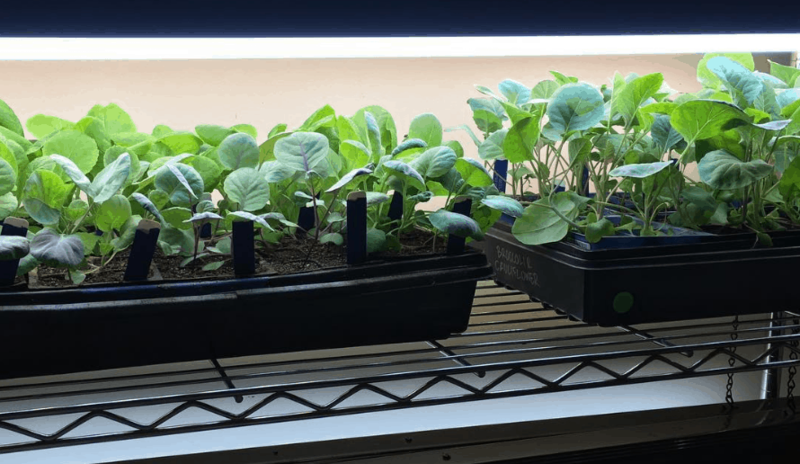 Since we grow so much food, we built our own indoor grow light setup for about $300, but this is an investment that more than pays for itself each gardening season and we garden in all four seasons every year. 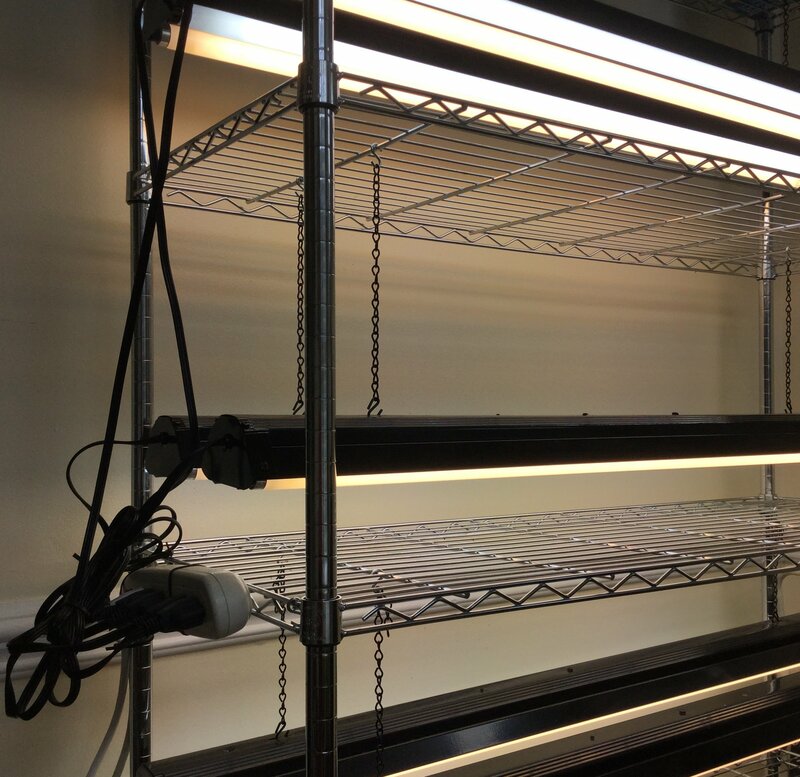 Our indoor grow light setup (click here to learn how to make your own). All the plants have graduated and gone to live outdoors for the summer, but it will be full of fall seedlings by late summer. Now, consider this: if you go to a garden center and get a tomato plant/seedling, you’re going to pay somewhere between $4-10 per plant depending on where you live, the variety of tomato and the size of the plant. There’s a pretty good chance that you’re only going to be able to buy a hybrid tomato plant, which means you won’t be able to save seeds that will grow the same type of tomato again next year. There’s also a good chance the plant was treated with a systemic pesticide soil drench like a neonicotinoid, which over 800 peer reviewed scientific studies say kill birds, bees and other beneficial critters even when used as recommended by the manufacturers. That’s the most expensive tomato plant you could possibly grow in your garden. Young tomato seedlings growing under our grow lights in Ladbrooke soil blocks. Every fuzzy hair you see on the tomato stem can become a root when buried in soil. See those fuzzy tomato stems? As it turns out, tomato stems can form adventitious roots if they’re planted in the soil. Larger, deeper root systems mean less water and fertilizer inputs, healthier plants and larger fruit yields. Now, the first time you do this trick, you’ll feel like you’re murdering your plants, but it will pay off big time. Remove lowers branches – Cut off all the lower branches on your seedling, leaving only the top few branches and the growth tip. Dig a trench – Dig a trench larger enough to lay your tomato seedling down sideway while still giving the first stems enough room to stick out a few inches above the soil surface. By laying the plants sideways, you’ll help them develop better vertical roots. This is especially helpful if you have leggy seedlings. Bury the stem and lay the plant sideways – Add some worm castings (these are the best quality and most affordable worm castings on the market) or finished hot compost into the hole. This will provide your tomato plants with biological fertility via beneficial microbes that also help protect them from pathogens. Don’t use synthetic nitrogen fertilizer products since these are bad for the long term health of your soil and have also been proven to make your plants more attractive to pest insects. Once your trench is ready and you’ve added a good microbe-rich media (worm castings or compost), bury the tomato plant and stem up to a few inches below the first branches. Step 1: note the removed leaves. Step 2: disrupting the soil as little as possible, dig a trench; add worm castings or finished hot compost. Step 3: bury the plant sideways, covering the stem to just below the first leaves (which will help the plant grow more robust vertical roots). Put mulch back over the soil surface and add a stick next to the stem to prevent cutworms (the “stick trick” mentioned below). 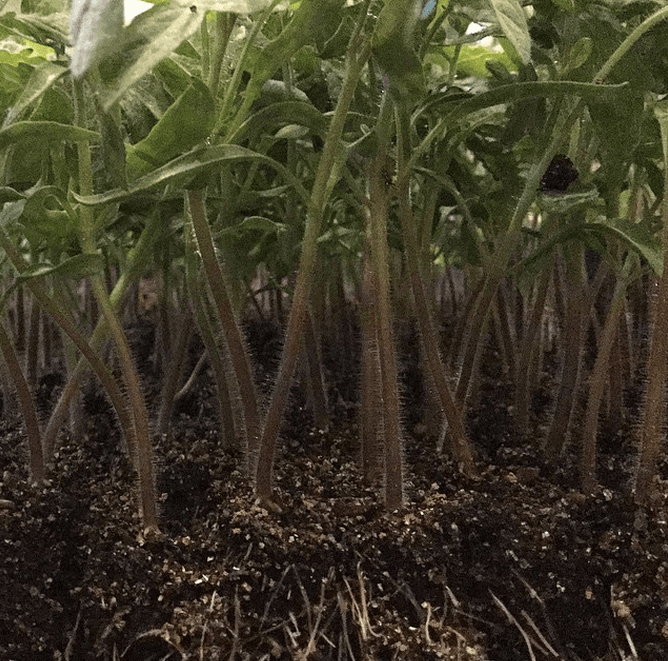 Your buried tomato stems will soon produce new roots and you’ll end up with plants that will outgrow and outperform a shallow rooted tomato plant. This trick is especially important if you’re growing your own seedlings rather than buying mature thick-stemmed plants at a garden center. Cutworms. The bane of many farmers’ and gardeners’ existence. These are the seedling-munching larvae of Noctuidae moths. These critters can make you think evil, murderous thoughts when you go out on a spring or summer morning to find your once beautiful, healthy seedlings chopped down and lying dead on the ground. Surely, our brains could outsmart a moth baby’s brain without resorting to using pesticides, right? Yep. And the solution is stupid simple, free and 100% effective if you do it right. When you transplant your young seedlings, gently insert a stick (about the size of a toothpick or slightly larger) into the ground right next to the stem of your seedling. The larvae will feel around the stem of your plant, detect the stick and be fooled into thinking that the plant stem is too tough to chew through. Then it will move on in search of another victim. The stick trick = no more cutworms! 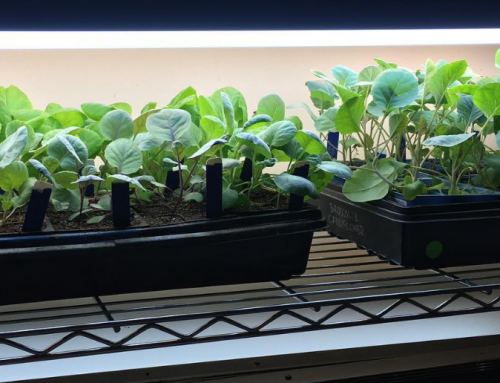 We use the “stick trick” on all the spring/summer plants that we start indoors and transplant: melons, squash, cukes, tomatoes, eggplants, peppers, etc. We have yet to lose a single plant to cutworms when using this technique. 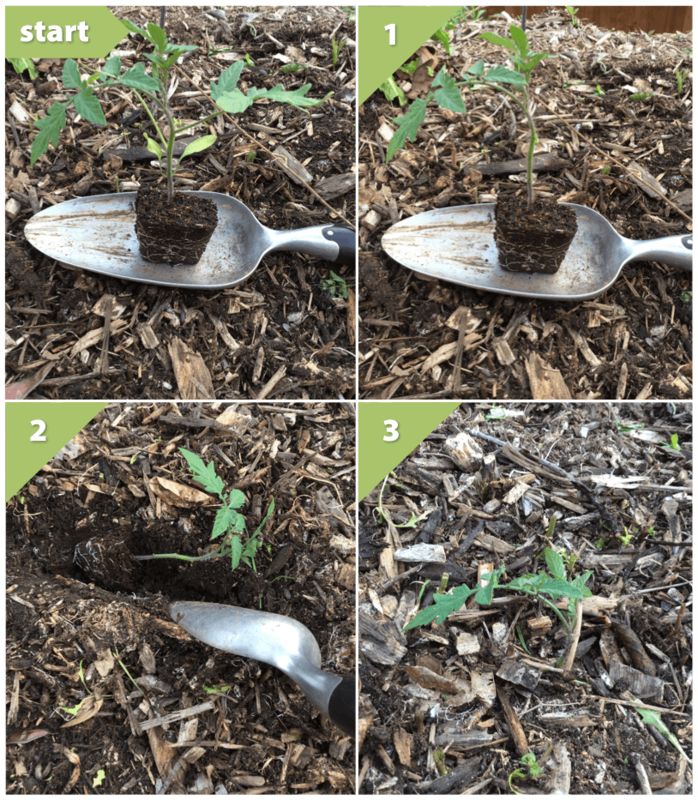 Tomato Growing Trick 4: Got Mulch? Many people talk themselves out of gardening by saying I don’t have time to plow, water, weed, fertilize, etc. We haven’t plowed our soil in seven years; we don’t ever plan to plow our soil again because of how destructive it is to the soil ecosystem. We only water during periods of drought or if our seedlings are very young. The only weeds we have are in the few patches of grass we have left, and many of those “weeds” are edible plants that we eat. We don’t use conventional fertilizers, instead focusing on long-term biological soil fertility. This is because we have a pretty good appreciation for the living systems that make soil work (the soil food web), soil ecology and plant (and soil) succession. We feed our soil what it knows how to eat and our soil feeds our plants what they know hot to eat so that our plants can feed us what we know how to eat. Soil is like the skin on your body: it’s a protective organ. Scrape off your skin, and a scab will form. Likewise, nature does not tolerate having its soil scraped off and exposed to the elements. Uncovered soil will soon begin healing via “weeds,” nature’s scabs, aka the pioneer plants in plant succession. be prepared to let nature cover her own soil with the plants of her choosing. *You probably won’t like option #2, and it usually causes conventional gardeners and farmers to engage in perpetual chemical warfare. We like using a combination of green mulches (cover crops), fall leaves, and wood chips that we get free from local tree service companies. All three types of mulch will drastically improve your soil biology/fertility, thereby replacing your need to fertilize. Especially if your soil is young, we’d recommend you take things a step further by also using some combination of worm castings, hot composted compost (aka using the Berkeley method), compost teas and really good mycorrhizal inoculants like this one. Wood chips form an insulating surface on your soil surface, reducing soil temperature fluctuations and plant stress, while increasing water penetration and retention. Finally, wood chips prevent weed seeds in your soil seed bank from germinating and growing in your garden beds. Less work + less inputs + less money spent = more and better food? Yes please. Does this sound like a zany opinion that’s too good to be true? Here’s the research to prove it. IMPORTANT NOTE: Top Dress With Wood Chips, Do NOT Plow Them Into Your Soil! We top-dress our beds with about 3-6″ of wood chip mulch twice per year, and let the soil microorganisms slowly convert the wood chips into bioavailable nutrients that they bring down to our plant roots for us (the plants also feed the microbes all kinds of goodies in return via their root exudates). It’s very important to note that you do not want to plow the wood chips into your soil, or you’ll lock up the nitrogen in your soil as the soil microorganisms borrow it while they digest the carbon. Low nitrogen = plants that don’t grow. So, just put the wood chips on top of the soil surface and let nature do the rest of the work for you. This should come as no surprise to you, but tomatoes grow on plants, not grocery store shelves. And tomato plants will grow better and produce more fruit when you cover their soil with wood chips. Since many common tomato plant diseases are caused by rain splashing soil pathogens onto the lower leaves of the plants, you’ll also be pleased to know that using wood chips reduces or eliminates this problem too. 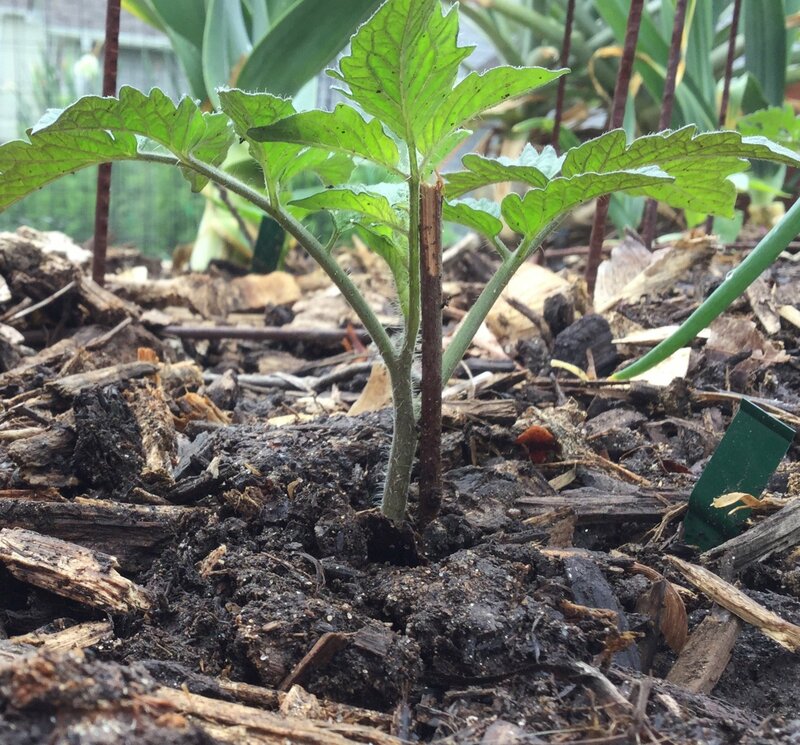 When transplanting your tomato seedlings into your mulched garden beds, simply pull back the mulch from the planting spot, make a small hole and plop it in the ground (using the deep-burying trick highlighted in trick #2 above). You can do the same thing when you direct sow, but only make a hole big enough for the type of seed you’re planting. What the heck is “tomato suckering”? 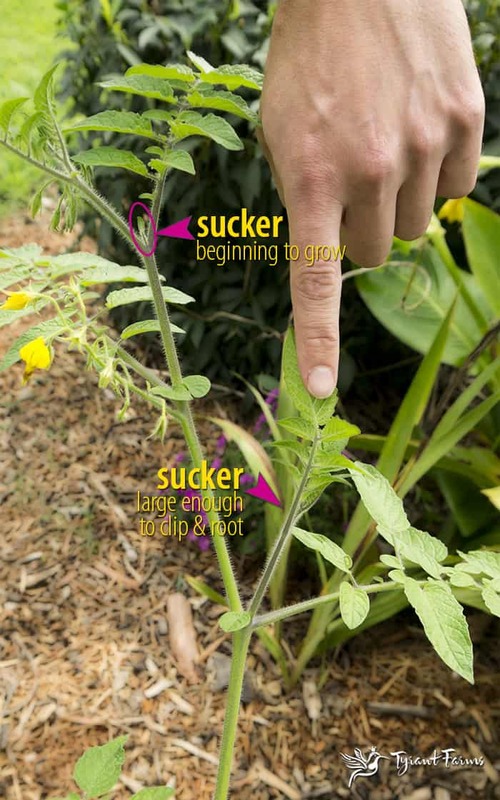 As tomato plants grow, they’ll produce a branch and a “sucker” between the stem and the branch. The sucker grows like a new stem, producing new branches and suckers along the way. A closer look at tomato suckers via TyrantFarms. Many people tell you that you have to remove the suckers to reduce plant diseases and get the biggest fruit from your tomato plant, the idea being that more air can flow through your plants and the plant will put more energy into fewer fruits. If you’re trying to grow the world’s biggest tomato and you have the time to remove all the suckers as your tomato plant grows, then you might want to go ahead and sucker your plants (and be sure to sanitize your tools when you do). However, if you’re growing more than one tomato plant and you’re into low-maintenance gardening, don’t sucker your plants. You might end up with slightly smaller tomatoes on your beefsteak varieties, but if you’ve got good soil and healthy plants, you’re probably not going to notice a dramatic difference in fruit size, and you’ll certainly get more fruit. Also, one of the fastest ways you can spread diseases throughout your tomato plants is by constantly touching them, cutting them with non-sanitized clippers or other tools that have pathogens on them, and/or leaving exposed wounds on the plants where you removed the suckers. As noted in the picture above, one nice thing about suckers is that you can remove and root them to grow new tomato plants. We’ll do this in mid-summer to get another big round of tomatoes before first frost – you can read about that here if you’re interested. Note: This is a trick for advanced gardeners/growers only. If you want to grow your favorite heirloom tomatoes, but live in an area where your heirlooms keep getting wiped out by diseases despite your best efforts, we highly recommend grafting your heirlooms onto a hardy tomato rootstock (this is the same technique used with many fruit trees). My wife Susan (The Tyrant) and I wrote a detailed how-to guide for grafting heirloom tomatoes on our personal blog that will give you all the info you need to start grafting your heirloom tomatoes. Tomato Cages – Want to learn how to make strong, attractive tomato cages that can last for over 40 years? Read this article to find out how. We hope these tomato growing tricks help you have your best summer garden ever! Salsa time at Tyrant Farms! Fresh-picked tomatoes, hardneck garlic and peppers ready to go into the blender. Just in case you’re not already a GrowJourney Seeds of the Month Club member, we’d love for you to give us a try (for free) to see if you’d like to start growing with us! And don’t forget: a GrowJourney Gift Membership also makes a unique and special gift. Sometimes our articles will contain Amazon affiliate product links. These products have been carefully curated by our team. We use them, trust them, and know they work (or in the case of books, know that the information is extremely helpful). GrowJourney may earn a small commission on any sales that are generated via these affiliate links (without any additional cost to you). Cofounder & CEO of GrowJourney. Organic gardening teacher, garden writer and permaculture enthusiast. Lover of life and wife (aka "The Tyrant"). Obviously my cut worms are smarter than your cut worms, tried the toothpick method and was still losing tomato seedlings. ARGH! I have switched to plastic collars made from empty juice bottles. Way more time consuming, but seems to work so far. I will be spreading some diatomaceous earth once the summer rains subside. I use rootone to help the cuttings get a start. This year I am trying the new Garden Gem tomato developed by Harry Klee at the University of Florida. Which are supposed to have superb flavor, and good yield of about 22 pounds per plant, and are supposed to be somewhat resistant to the many diseases so prevalent here in Florida. I am growing them in raised beds that have had the soil Solarized. So far they are looking really healthy! Wow, sounds like you have some robust cutworms! We typically just sticks from around our yard which tend to be thicker than toothpicks, so I’m wondering if that might be part of the reason we’ve had such good success with the “stick trick”? It’s also possible that Florida cutworms are different (perhaps even a different sub-species) than what we encounter here in South Carolina. Another method that works is taking the core out of old toilet paper or paper towel rolls and putting them around the young seedlings – basically the same thing as your plastic bottle method but it’s easier to cut paper than plastic. By the time the paper is turned to mush, the seedlings are larger than cutworms are willing to take on, unless there are unusually heavy rainfalls. Garden Gem tomato sounds interesting – love to hear what you think once you’ve gotten a harvest. Best of luck! Will tomatoes regrow from a buried root from last year? We stopped taking care of the plants and figured we would pull them out because they were dry and old. When we went to pull them there were surviving fresh tomatoes all over the plants. We cleaned up the plants anyway but left the roots in the ground. Bad idea? Lucinda: Tomatoes can technically grow as perennials in the right climate conditions. There’s a massive tomato plant growing in Disney’s Epcot Center greenhouse that’s many years old and produces thousands of pounds of fruit (the photos of it are amazing). If you live in a warm climate and haven’t had any frosts or freezes, it’s possible your tomato plant could have over-wintered. Comment…what is the remedy for tuta absoluta infestaion. We don’t have a problem with those since we grow using polyculture plant systems that discourage the buildup of any one pest or disease. We also recommend intercropping with plant species that attract a diversity of predatory insects – both the plants used and the insects attracted will vary depending on where you are (it looks like you might be in Kenya). There are plenty of predatory insects that will feast on Tuta absoluta, such as Nabis pseudoferus (a predatory damsel bug). Another possibility as part of an overall plan would be using foliar sprays of actively aerated compost teas made from hot composting methods, as advocated by Dr. Elaine Ingham. The predatory microbes in the tea, when applied as a foliar/stem spray, would likely eat/parasitize the moth eggs and larvae. There likely isn’t a single “silver bullet” answer to the problem, but we’d encourage you to think longterm through a systems approach/paradigm. We’d strongly recommend avoiding use of pesticides, since they don’t tend to discriminate between beneficial and pest insect, and almost inevitably lead to systemic imbalances that favor pathogenic and pest organisms. Not to mention the pests will inevitably develop resistance to the poisons leading the grower down the expensive and painful path of the “chemical treadmill.” Best of luck! What exactly is green mulch? Green mulch simply means a cover crop, some of which may be edible, some of which aren’t. The most effective green mulches tend to incorporate multiple plant species, for instance legumes and rye mixed together, but we also like to grow single species cover crops/green mulches like Austrian Winter Peas that produce delicious edible pea shoots and soup peas, before we chop them and use them as a mulch in the late spring. 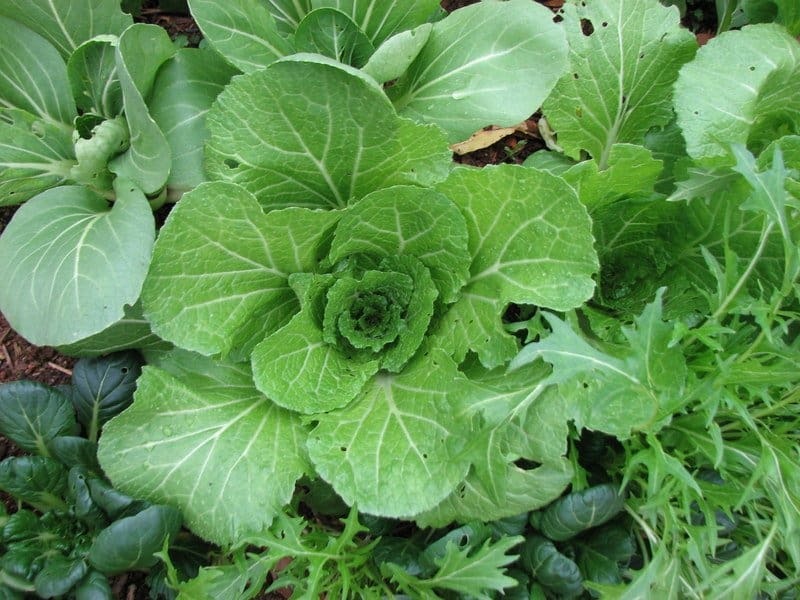 Green mulches increase soil microbial activity by feeding and promoting the beneficial soil microorganisms that are critical to healthy soil systems, and therefore critical to growing healthy plants. With the exception of deserts, you won’t ever see exposed soil in nature – it’s always covered with either brown mulches (dead plant debris) or green mulches (living plants). Hope that answers your question! For cutworm problems, my dad would take newspaper and cut in into strips and wrap the plant stem and bury it when he planted. Didn’t lose any plants. Interesting! Never heard of that trick. Seems like the newspaper would break down pretty quickly, but I suppose by the time it decomposed, the plants would be large enough to be beyond a cutworm’s cutting abilities. For cutworms, wrap tin foil around the stem. Easy fix. It conforms, doesn’t harm the stem, and is super easy to use. I just blew your mind. I love the idea of using toilet paper rolls and paper towel rolls. What a great way to recycle and compost at the same time plus protect your plants. I am an avid juicer and need all the tomatoes, cucumbers and greens I can get during the summer and these tips should help with the tomato aspect. Thanks, glad you found the article helpful! We planted tomato farm around one Acer , the plants growth maximum only one meetar height. The breed is hybrid 448 quality. We give Water through drip irrigation. Is any technology that I need to use for more grouth. Sounds like you just have a shorter cultivar. If you’d like larger plants that continue producing rather than just setting a single round of fruit, consider getting indeterminate tomato varieties. Hi Sally! All tomato branches should eventually form flowers and fruit. Some people do remove “suckers” – those are the branches that form between two other branches. We don’t bother to do that due to time constraints, but some people swear by it. Keep in mind that every time you cut off a tomato branch, you’re basically performing surgery which means you are potentially exposing the plant to an infection. So, if you do remove branches, make sure you’re using sanitized clippers (dip them in rubbing alcohol or wash them in hot soapy water first). As for the black tomato varieties being ripe: they should have dark green/black shoulders and maybe a red bottom (depending on the variety). But sometimes the colors vary a little bit. Curious to know if organic tomato-growers may or in fact should use tomato set on blossoms. If so, are there particular brands that are certified organic? Can’t say for certain, but to the best of my knowledge, there are no tomato blossom set products that are approved by the National Organic Program (NOP) for use on certified organic farms. Are you having difficulty with fruit set on outdoor plants? If so, it may be a heat issue (sustained temps over 90F drastically reduces fruit set) or a soil nutrition issue. Sometimes in greenhouses, fruit set can be limited by lack of wind or pollinators to “shake” the flowers and cause pollination. I have read quite a lot about planting of tomatoes and also read a few of the farmers comments here and there. It’s now time for me to move to soil and put these theories into practice. Pls l leave in Nigeria but I do visit the US often. My friend in Nigeria few months ago did mention about upside down tomatoes. My question is, can any specie of tomatoes be planted as upside down tomatoes? My second question is that where can I buy these upside down tomatoes,just last month I sent my sister to check it out for me at SAMS but she was told that it’s not the season. I thought we could get them on shelves year round. When next can we get them on the shelves? 1. Yes, any species of tomato can be grown in an upside down system. 2. There are a few different ways to do it: some people use bags, some people use containers. You can buy or make the upside down growing system and start your tomato plants whenever the season is right (depending on where you live). Best of luck! I love to grow tomatoes in my home garden but didn’t know where to start. Thank for your tips. Very simple and easy to get started, I will follow your advices in my next year’s gardening projects! Glad the article was helpful, thanks James! My tomatoe plants are five foot tall, not fertilised, have wood chip mulch, healthy but almost no fruit. Last year under same conditions hand massive crop of fruit. My plants flower but flowers fall but no fruit. What can I do. Hmm, sorry to hear this, Paul. If your plants are producing flowers but the flowers aren’t setting fruit, that sounds like one of three things (or some combination): 1) temperature (if the temps dip below 50F or rise above 90F, they won’t set); 2) Too much nitrogen – doesn’t sound like a problem since you didn’t fertilize; 3) Infrequent water – are the plants getting regular water and/or is the soil moist but not powder dry or sopping wet? My question is in regards to the wood chips….from any tree? I’ve heard that cedar is not good for a garden. Hubby cuts firewood so we have access to fir, cedar and alder chips. Are all of these fine for the garden mulch? Sandra: There’s not a ton of research on this topic, but here’s our opinion based on what we’ve read and observed: each type of wood is a little different as far as how long it takes to decompose and what type of microbial activity (or fungal species) it promotes. Fir, cedar, and alder are all fine to top-dress your garden beds with. Fir and cedar have some pretty potent anti-fungal resins in them so they’ll take longer to break down. (Native Americans used cedar and black locust lumber for their buildings since they’re so resistant to rot.) Our personal preference is hard wood chips (oak, poplar, etc) but we’ll use any type of wood chips – especially if they’re free. The only woods I’d caution you about is hickory and black walnut since they’ve got a substance called juglone that can stunt or kill most of the annual plants growing in a typical garden (the compound essentially helps the trees select the type of plants they wants growing near it). Even then, if you have a pile of walnut/hickory wood chips that have broken down for 6-12 months, the juglone would likely have degraded to the point that any impacts would be minimal. Thank you for giving me a good trick. Please, let me add this comment. In my opinion, saving tomato seeds is a full satisfaction activity. Year after year, as I select the best plant and fruits to save seeds off, I will be developing a new strain of my own plant. It will start to take on characteristics of its own. It will be adapted to the soil of my garden and growing conditions. These new characteristics will make this new plant stronger than any seed I would buy. Great tip! We also recommend people save their favorite tomato seeds from year to year – we certainly do that as well. Ever try increasing fruit size by inducing polyploidy….you can do this by soaking the seeds in a colchicine solution…gonna try it on a few plants this season. Never heard of this, but if you get good results, please check back with us to let us know more! I have never heard of lying tomato plants on their sides to transfer to the garden. Did i read that correctly? i grew my plants from seed and had to leave them in the pots longer than I preferred due to unexpected cold weather so they are spindly. I have never heard of lying tomato plants on their sides to transfer to the garden. Did i read that correctly? i grew my plants from seed and had to leave them in the pots longer than I preferred due to unexpected cold weather so they are spindly.. Yes, that’s correct. You dig a trench in which you bury the root ball and part of the stem, laying the plant on its side with the top slightly bent and above the soil surface. The plant will quickly straighten out and grow upright, and will develop a more robust root system at the same time. Is it beneficial to till around your plants to help stimulate growth? My Mother would till around the plants, but new why. She would always say that it help. Thanks, Charlie in Texas. Hi Charlie! In our opinion, no. She likely did that to eliminate weeds, but the same aim can be accomplished by using mulch which also feeds and protects the soil. I have beef steak tomatoes in pots is there a difference between potting soil and garden soil ? Hi Bonnie! Yes, there’s a difference between potting soil and garden soil. Potting soil is lighter and contains higher amounts of ingredients like perlite and vermiculite. Perlite helps make sure the soil in the pots does not compact while vermiculite helps hold moisture and nutrition in the pots. Garden soil is much heavier than potting soil and will almost always need to be amended if you’re using it on potted plants. You can read more about the distinctions between seed starting mix vs potting soil vs garden soil here: https://www.growjourney.com/tag/seed-starting-mix-vs-gardening-soil/. Hope that helps! We started our tomoatoes on our outside balcony but it’s getting colder and we live in Seattle. All the tomato plants have little baby tomatoes. If I bring them in with my grow light, will they continue to grow? Sorry for the delayed response, Anastasia. Your comment was accidentally filtered to spam. Answer: it depends on your grow lights. Overhead fluorescent bulbs? Nope, that won’t be enough. 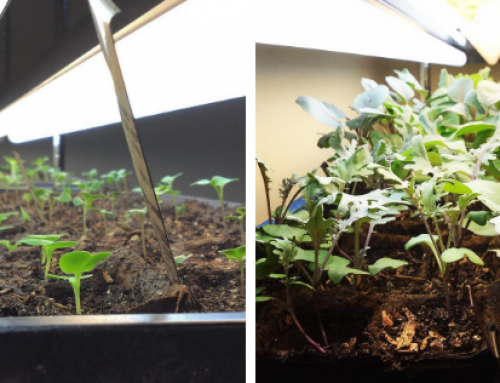 But if you have LED grow lights like these https://amzn.to/2HUY4az (affiliate link to good LED grow lights on Amazon) then you’d be able to keep your plants growing indoors. If you have your tomato plants in pots that you can easily bring in and out, you’d still want to bring them outdoors into direct sunlight any time the temps are above about 55 degrees F, assuming your balcony gets 6+ hours of direct sunlight. 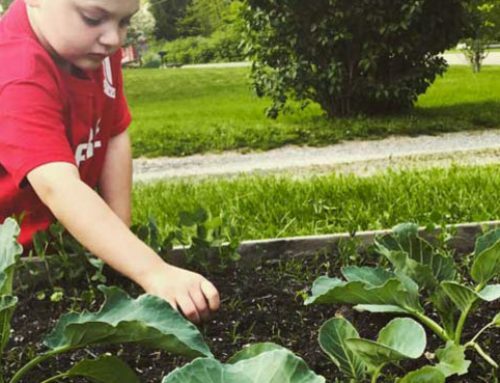 Want An Organic Garden? 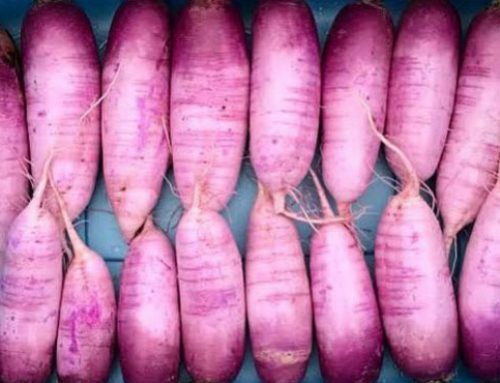 Here’s Why You Need Organic Seeds.